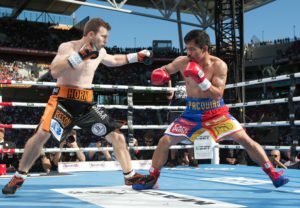 WBO welterweight champion Manny “Pac Man” Pacquaio won at least 8 rounds if not 9 rounds Saturday night down under in Australia over “club fighter” Jeff Horn who is from Australia. The American referee Mark Nelson should switch from pro boxing to pro wrestling. I never saw so many “head locks” in one boxing match. Just when the stench was clearing from the first Kovalev-Ward referee Robert Byrd’s bias work of allowing Ward to clinch 46 times without losing a point. Ward won by a point on all three cards so if one point was taken Kovalev would have retained his title with a draw. Nelson allowed Horn to do whatever he could get away with. Horn’s head did more damage than his Fists did. In 1995 “Big” George Foreman defended his IBF title winning a disputed majority decision over German Axel Schulz. In refusing to give Schulz a rematch he was stripped of his IBF title. In 1997 he lost a disputed majority decision to Shannon Briggs and retired at 48. Pacquaio is 38 and the media is trying to retire him like they did Foreman. Pacquaio wants the rematch and he needs to have some say about the referee and judges even though Horn is now champ especially if the rematch will be in Australia which one would be sure it will be. Officials everywhere in the world should be held accountable for questionable decisions by their commission.